When you plan to nail the Experimental Bride look, you get puzzled with various designs, embellishments and colours aren’t it? How about we help you decide which fabric to choose and why? Let’s understand the quality of each fabric that will help you customize your wedding lehenga. Velvet: It is well known for its luxurious texture and natural sheen. It looks eminent both with heavy or minimal embroidery! 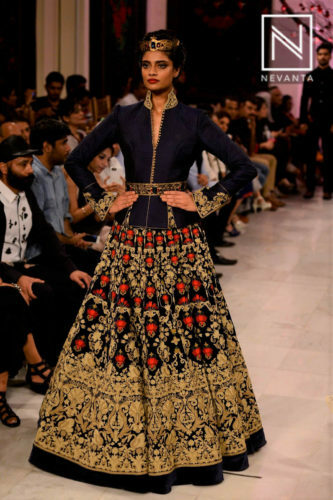 We have Sabyasachi and Rohit Bal who work great with velvet lehengas. A velvet lehenga has a beautiful fall and marvelous drape that flatters the body. 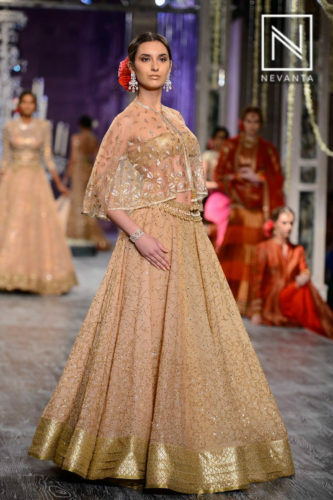 Generally, people assume that velvet lehengas are really heavy to carry off on your wedding day, but good designers use Lycra Velvet for your lehenga which is lighter compared to the regular velvet. Raw Silk: Raw Silk is considered as the modern fabric for the Experimental brides. It is crisp, clean and shiny . You don’t need a lot of embellishments on it as the fabric material stands out on its own. It adds volume, so if you have a petite frame you can opt for it. Experiment your look by pairing up a benarasi or zardosi lehenga with a raw silk blouse. You can see Manish Malhotra, Sabysachi and Payal Khandwala collections if you are willing to give this a try! Satin: Satin is also used when it comes to customized lehenga because of its gorgeous lustre. You can wear a satin lehenga with variety of embellishments, zardosi or aari work on it. But while opting for the fabric, choose a heavier satin called baroque satin instead of the thin and feeble satin as it neither has the lustre nor the bridal look on it. Chanderi: A fabric hailing from the humble grounds of Madhya Pradesh is inspiring Fashion designers to experiment Indo-western apparels and also making it perfect for experimenting with your bridal looks. The texture of this fabric is sheer and glossy. It drapes well and has a subtle shine to it. 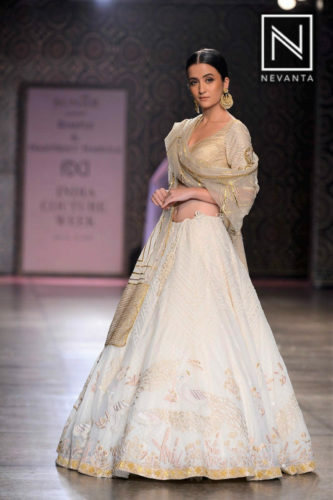 You can sport a Chanderi lehenga with smaller motifs all over chanderi and a zari border at the base. Sheer: If your wedding is planned during Summer season, you definitely need to opt for a fabric which is comfortable with the rise in temperature. You can opt for Chiffon or Georgette lehengas. Chiffon is an exquisite sheer fabric and Georgette is a grainy sheer fabric, both get draped sumptuously on your body keeping you cool throughout the wedding. You can ornate your sheer lehenga with zari, zardosi and fine embroidery.